Better Media is a transparent co-operative endeavour, empowered by collaborative open source tools. We use Open Collective to transparently collect and spend money. Everyone can see where all our money comes from, and how it is spent. Everyone who signs-up as a contributor is also invited to join our online organising and decision-making spaces. At present we use the Sandstorm.io (an open source platform for easily and securely self-hosting web-based productivity apps) to run WeKan (a Trello clone), Rocket.Chat (Slack clone), and Etherpad (collaborative document editing), together with a WordPress website, a Discourse forum for discussions, and Loomio for decision-making. Once enough people have signed-up to cover the admin expenses the plan is to incorporate Better Media as a formal legal co-op using this set of model rules (for a multi-stakeholder co-operative Company Limited by Guarantee Community Interest Company), and in the spirit of starting as we mean to go on we’ll start using those rules to democratically govern ourselves now too. 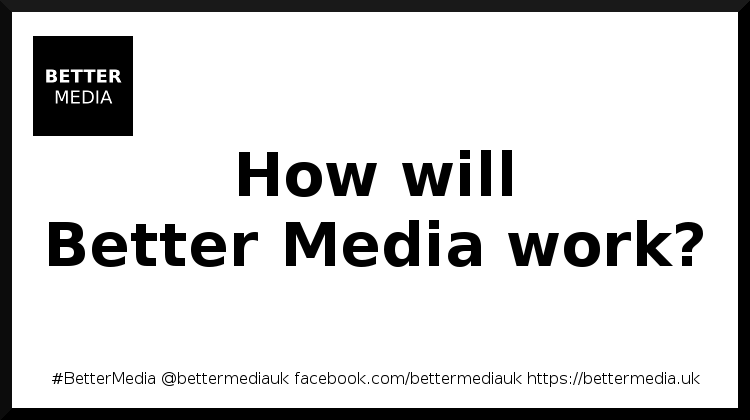 Join us now and together we can build the movement for #BetterMedia the UK so desperately needs. Previous: Previous post: What do we mean by Better Media?